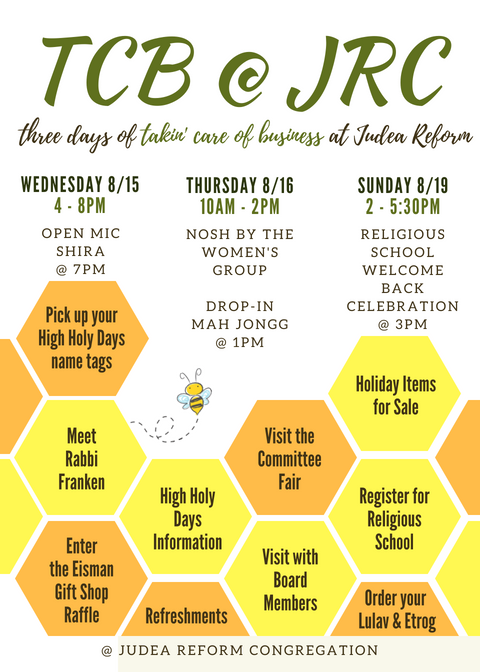 Back by popular demand: three days of “Takin’ Care of Business” at Judea Reform! Meet our new Interim Rabbi, John Franken! Shop the Eisman Gift Shop for all your holiday needs: honey dishes, round challah boards, shofars, prayerbooks, and more. Enjoy special deals! Enter the Eisman Gift Shop raffle drawing: You could win a gorgeous wood-carved, Shabbat, challah cutting board valued at $140.00. Tickets are $5 for 10 raffle tickets. You can purchase your raffle tickets during TCB hours at the Eisman Gift Shop. *Note: High Holy Days name tags will only be available for members who have renewed their membership for the 2018-19 Fiscal Year (started July 1, 2018). Name tags not picked up at TCB@JRC by August 19 will be mailed to renewed members' home address the following week. Wednesday 8/15: Open mic shira at 7pm with Music Director Allan Friedman - bring an instrument or your voice! Over 150 families joined us last year throughout the days of our inaugural TCB@JRC. We look forward to seeing you there! Click "Attending" on our Facebook Event!